Allen was saved at the age of eleven years old while attending the Bible Baptist Church in Jacksonville, Arkansas. Our pastor was Dr. Roy Harris. 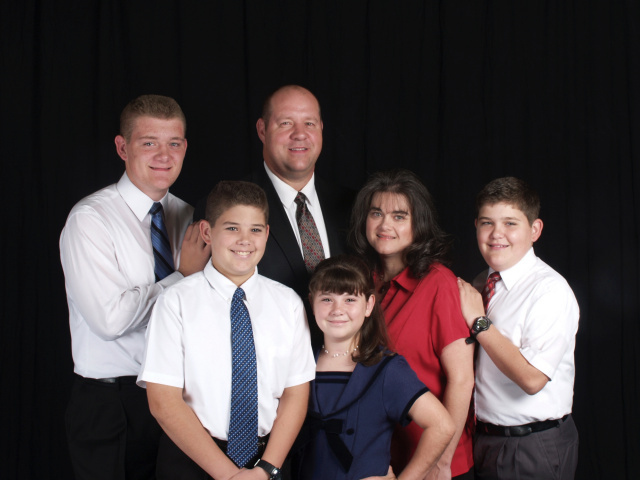 Allen was saved through a direct result of the church’s bus ministry. Upon high school graduation he attended Oklahoma Baptist College under the leadership of Dr. Jim Vineyard. Stephanie was saved at the age of eleven while at church camp. Her grandparents are Dr. Roy and Anita Harris. She is a graduate of Oklahoma Baptist College. Allen and Stephanie both served as Sunday School teachers, junior church workers and bus captains throughout their highschool and college years. Both served on staff of Bible Baptist Church under the leadership of Dr. Roy Harris. Allen served as the Youth Director, Bus Director, Junior Church Director, Dean of Students for Bethel Baptist College and the Associate Pastor during that time. Stephanie served as the Teen Girls’ Sunday School Teacher, Junior church leader, choir member and bus captain — as well as the church secretary for 10 years. Both have always been active in the soulwinning ministries. The Lord burdened our heart for the Mexican people while on a Teen Missions Trip with our church teens in July of 1997. After fulfilling our staff commitments, we began full-time deputation in August of 1998 – we arrived on the field less than one year later in July of 1999. We attended language school and graduated in May of 2000. The doors to the Faith Bible Baptist Church of Aguascalientes were opened in August of that same year. The Lord used us to establish three churches in the state of Aguascalientes. The three works have been turned over to national leadership. All of the works share the same name (Faith Bible Baptist Church), the main work is in the city of Aguascalientes. Pastor Rafael Ibarra de Leon is our national pastor. Pastor Ibarra was the first graduate of Faith Baptist Institute. The Institute trains men and women who have surrendered their lives to full-time service. The Institute men receive on-hand training through leadership in the missions and the main work. The church has seen a high day of 211 and has salvation decisions and baptisms nearly every week. We have active ministries such as: Sunday School, Bus Routes, Soulwinning Programs, Ladies Ministries, Children’s Ministries, Ranch and Village Ministries and a Bible Institute. We also have churches in the pueblos of La Labor and San Pancho. Pastor Raul Garcia is our national pastor in La Labor. The Institute men have started two mission churches under the leadership of Pastor Ibarra. Due to circumstances, the Lord closed the door for the Copelands to labor in Mexico. Their ministry continues under the leadership of Pastor Ibarra. Bro. Copeland will continue his involvement in the ministry through teaching modules in the Institute and in an advisatory capacity to Pastor Ibarra. In March 2011, Allen and Stephanie took a survey trip to the Island of Puerto Rico. The Lord burdened their hearts to take the gospel to the more than FOUR MILLION souls on the island. It is our desire to reach the Spanish-speaking people in the mountains and rain forrest area of Puerto Rico. Note by Kenny Cantrell: Allen has agreed to be a Field Rep for Badges & Boots. He is our contact person in Puerto Rico. They have already had some results, one of those is a S.W.A.T. member and his family being saved.